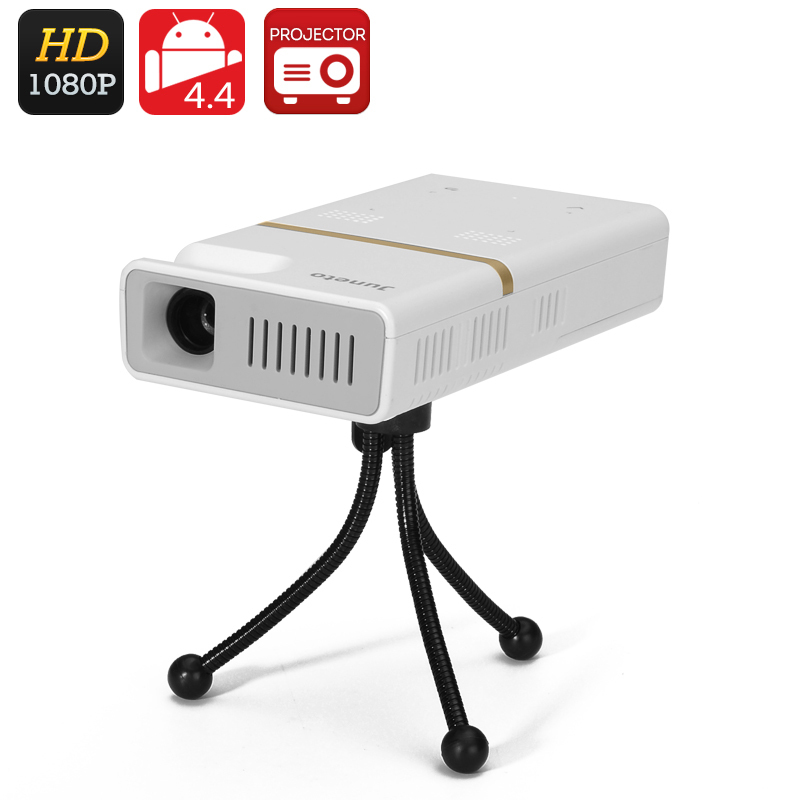 Successfully Added Juneto Android 4.4 DLP Projector - 1080P Support, 1000:1 Contrast Ratio, 854x480 Resolution, 130 Lumen, Wi-Fi, Bluetooth 4.0 to your Shopping Cart. The Juneto DLP projector is perfect for the whole family as it lets you download movies, surf the web or play games on a portable large screen. This projector uses DLP technology which incorporates many tiny mirrors; these are rapidly moved to reflect the correct amount of light producing a seamless image. As this projector uses a powerful RGB LED light source it achieves a better color gamut leading to a crystal clear image with sharp definition and great color depth. So with the Juneto DPL projector you can enjoy a cinematic picture quality with a native 850x480 resolutions and 1000:1 contrast ratio. The Juneto projector has Bluetooth 4.0 connectivity making it easy to use this mini projector with a wireless mouse as well as providing wireless file transfer from your mobile phone or tablet. Using the Android 4.4 OS makes this projector a fully equipped multimedia device as it has plenty of processing power making it much more than just a projector. You can use the Wi-Fi network support to surf the web and download movies as well as access the wealth of applications on the Google Play Store. A range of ports will provide ample connectivity so as well as accessing content on the built in memory you can play from a micro SD card, USB memory pen or connect to a DVD / Blue Ray player as well as your games consol. With a 3.5mm audio output the built in speaker can be supplemented by an external sound system and all this comes at incredible value. The Juneto DLP projector comes with a 12 months warranty, brought to you by the leader in electronic devices as well as wholesale mini projectors..